Today I'm making popovers. I've never had popovers before and until yesterday had only a fuzzy idea that they were some sort of bready concoction, maybe close to a muffin. Well, it turns out they are a version of English Yorkshire pudding, i.e. baked hollow rolls with a contrasting crunchy, flaky exterior and a moist, eggy interior. I love Yorkshire pudding with roast beef and gravy, so what would there be not to love about its American cousin. But I ask, how does one eat this puffy popover when it's not meant to be slathered in savoury gravy? From my research, popovers are often served for breakfast, cut open and slathered with butter and jam, sprinkled with sugar, or stuffed with cheese. Yum! Sounds then like they'd make a fine accompaniment to Afternoon Tea, which could turn this overcast wintry grey day into a 'jolly little holiday' with dear jolly friends. And, that is exactly what we are doing later today. Looks yummy! Let me know how they turn out. Hi Brenda. Aren't they delicious! My family all love them. I use the simple Betty Crocker recipe: 4, 2, 2, 1. Four eggs, 2 c. milk, 2 c. flour, 1 t. salt. And we slather them with BUTTER. They're so good! They're perfect to accompany clam chowder or soups of any kind. Be sure to make a double batch, because they go fast. LOL I've also learned that the pan has to be completely greased, not buttered, or they will stick like crazy. Have fun! What a perfect Saturday adventure. Great for the eyes, nose and mouth. All at a Saturday pace, slow and methodical. I made popovers once. I liked them ok but wasn't sure what to do with them. They didn't taste like a roll or a biscuit. Thanks for the ideas. Lemon curd would be lovely or a creme filling... Leslie Land has a neat popover recipe with suggestions for success, too. They look so good! That's something I've never had good luck making. I made French bread today though and ate some hot out of the oven...oh my! I love home made bread! Hugs! 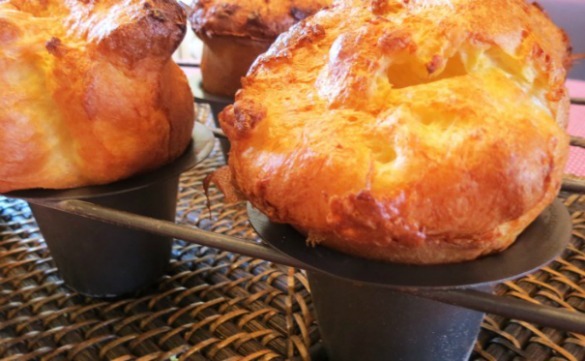 Oh, how lovely popovers are, hot from the oven, crispy on top and slathered with butter. I haven't made them for quite awhile. Mmmmm, good! Mmmm . . . I've never made these; let us know how they turn out. They sound so yummy. My mom used to make Yorkshire pudding, which I loved. My mother used to make them and eat them with golden syrup! Dear Brenda - I made popovers many years ago. I had forgotten them but now that I have been reminded must try some again. Thanks for the visit to your beautiful world today. Hope you have a lovely week. Hugs!